Dashcam footage from Florida's K9 Deputy Jeremie Nix's police cruiser caught the moment (the) white sedan pulled over to the side of the road and the boy's mother leapt out of the car screaming that her son was unresponsive. The baby's traumatized mother Nechole Crowell quickly flagged down Deputy Nix, who sprinted to help administer first aid to the young child. 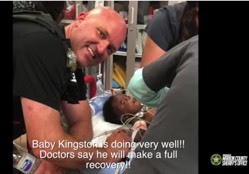 Despite the life-saving measures taken by this brave officer, he noticed that the child, Kingston, was not improving. Immediately, he sped off to the nearby Ocala Regional Medical Center to seek further treatment for the gravely sick kid. The Marion County Sheriff's Office shared some wonderful updates about baby King's medical condition following the officer's heroics. "Deputy Nix delivered the child to medical personnel, who then began treating the child. We are happy to report that Baby Kingston is doing very well and doctors say he will make a full recovery! !," the department's YouTube page explained. Click here to continue reading and watch the video.